Laminated? Glue what? But why? Well, let us tell you about laminated timbers. Natural timber can almost always be used in typical residential timber framing. There are wood species available in the sizes needed to pass engineering codes and to get the preferred look. Commercial timber framing with large clear spans, complicated designs, challenging joinery, and intense engineering requirements could require laminated timbers for strength. Laminated timbers or Glulams, as they are sometimes called, are thin timber cuts that are glued together. Below is a douglas fir glulamintated beam. Can you see the lamination lines? 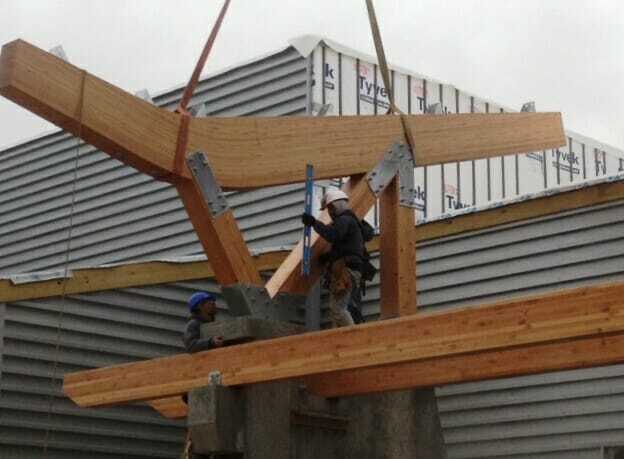 Glulam beams are stronger than natural timber and still have the same warm aesthetic. The lamination lines aren’t as obvious from a distance. The Nemacolin Ski Lodge entryway project needed glulaminated timbers. The entryway is located right next to the main lodge, and snow falling from the lodge’s roof could have been a big problem for engineering codes, but the glulam timbers help resolve that problem. 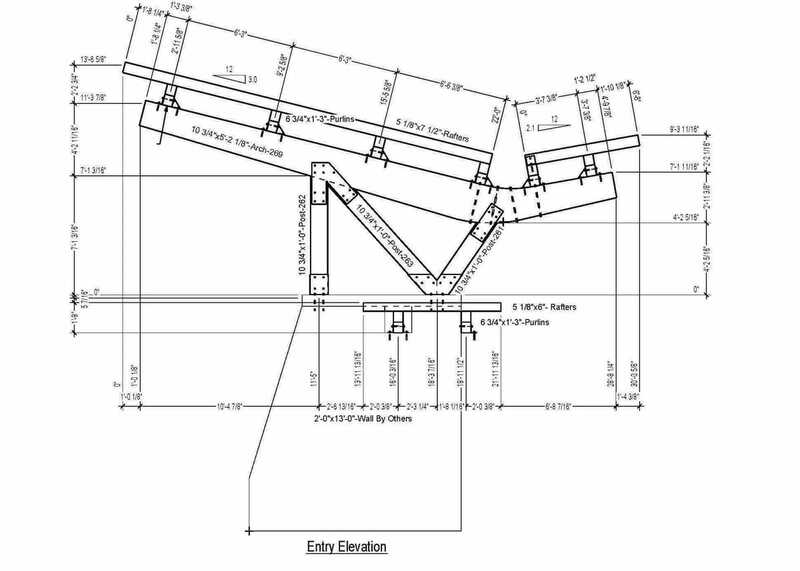 The 10 3/4″ x 62 1/8″ glulam beam, for this entryway, is shaped like a boomerang. I believe we have Duncan at Fire Tower Structural Engineering to thank for that. Thank you Duncan! He and our in house engineer, Jessie, worked on this engineering challenge, along with David Simpson from Allegheny Design Services. See it come together? It looks strong and it is strong! This great room has a very pretty and elegant truss design. The bottom chord of the truss is glulaminated because of the radius. Natural timber, if cut to have such a large curve, may not stay together. 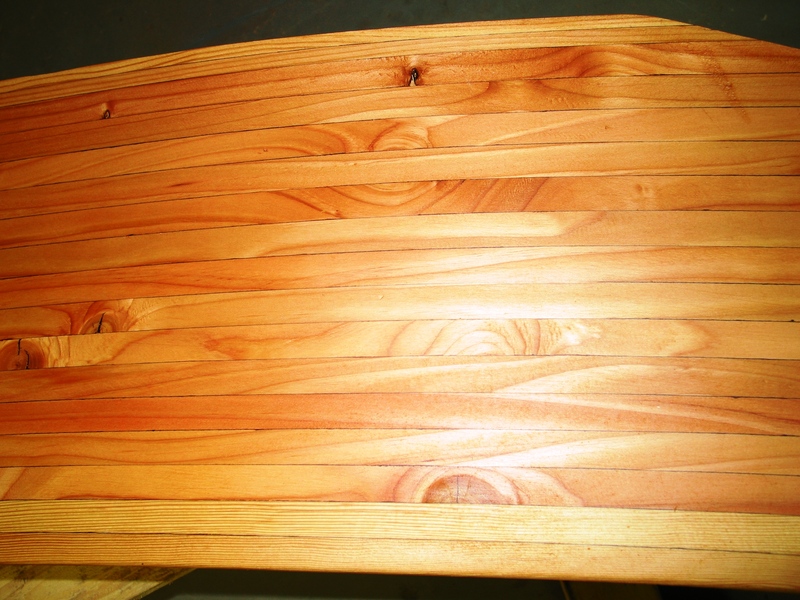 Laminated timbers are widely available in douglas fir. All the glulams shown in this post are Douglas Fir. 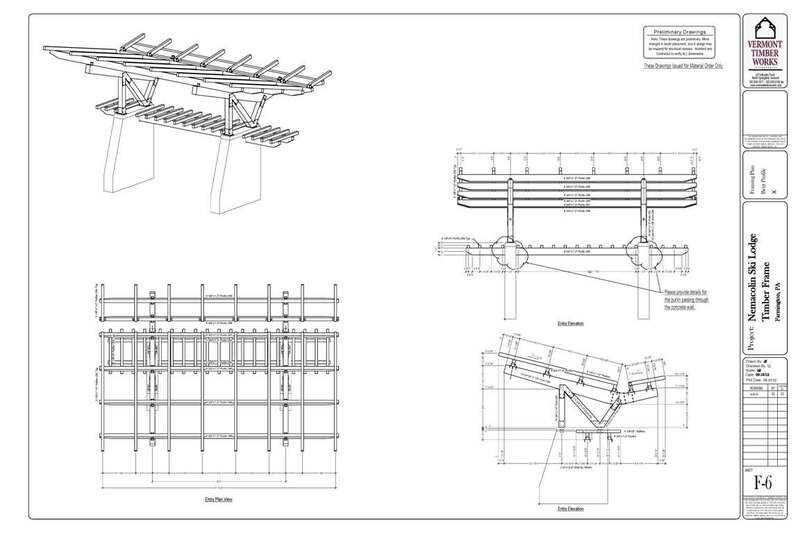 Glulam beams are also available in Southern Yellow Pine, Western Red Cedar, Alaskan Yellow Cedar and Port Orford Cedar. Thanks for stopping by our blog. If you like this post, or have timber frame questions, we encourage you to get in contact, ask an expert, or share your thoughts in the comment section below! When working with laminated timbers,, glulam or duolam, does anyone know about the structural integrity of the pegged joinery? Is it necessary to use metal fasteners? Sometimes we use pegs, but using them can be dicey depending on the location of the peg. Care needs to be take to make sure the laminations are not “blown out” or split apart.